I have a friend, Pete Miller, who has become a pizza guru. He attended classes held by Tony Gemignani (pizza god), and has tried endless recipes at home. So I asked him for his ultimate pizza dough recipe and he gave me this. It's adapted from the book PIZZA by Diane Morgan and Tony Gemignani. The recipe in the book calls for unbleached bread flour, but Pete insists you MUST use high-gluten flour. 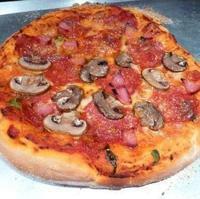 The high gluten generates a very elastic and chewy crust, which I thought was awesome. I put each pizza on a hot pizza stone for 4-5 minutes to generate a crisp bottom, which I think provided a great contrast to the chewy crust! In a small bowl, stir the yeast into the lukewarm water with a fork. Set aside to let the yeast dissolve for about 5 minutes. In another small bowl combine the cold water, sugar, salt, and olive oil. Stir to dissolve. To make the dough by hand, place the flour in a large bowl. Make a well in th flour and stir in the yeast and the cold water mixture. Using a wodden spoon, mis the dough thoroughly. Turn the dough out onto a lightly floured board and knead until soft and elastic, about 10-12 minutes. It will still be tacky but should no longer stick to your hands. To make the dough with a mixer, fit a stand mixer with the dough hook attachment. Place the flour in a large mixer bowl and add the yeast and cold water mixture. Mix on low speed for about 4 minutes. Push dough off the hook and let it rest for 2 minutes. Then mix again on low speed for about 6 more minutes. Push down the hook if dough rises too high and threatens to get in the motor. Turn the dough out onto a well floured board and and knead for a minute or two until it forma a smooth ball. To prepare the dough for rising, cut the dough into thirds. With floured hands pick up one portion of dough and pull the opposite edges together, wrapping them underneath towards the center to form a tight ball. Pinch the edge to seal. Repeat with the other two sections. Place each portion in a 1 gallon ziploc bag. Squeeze our any excess air and seal the bags. Refrigerate for at least 10 hours or up to 2 days (longer is better). Remove from the refrigerator at least 1 hour before using so the dough can come to room temperature. For me, making this dough into a pizza shape was the hardest part. The high gluten flour is so elastic that it just wants to bounce back! Here's what I did. First, I placed it on a floured surface, floured a roller, and rolled it out as best I could. Then I took it in my fists and tossed it round and round. I needed to toss it to a diameter of about 15 inches to get a 12 inch pizza after putting it in the pizza pan -- because it contracts so much. It's pretty fun to do, but you might want to watch a video on YouTube to get the hang of it (I did!). This was a fantastic crust. 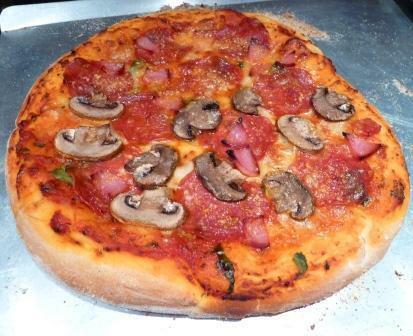 If you like a good thin-crust NY style pizza, you can't do much better than this at home! I changed out 1 c of KA Bread Flour for whole wheat. Created a nice crust on my pizza stone. Yes, it was very challenging getting it to stretch out as thin as I'd have liked it to stay, but still very tasty. This dough feels great when working with it. Thanks for the positive feedback Eliot! Oh yeah?! Let me have a bite of that! The Chicago style is actually called a "Pie" so it's two different things. With some roasted Pumpkin, Roasted Garlic, Almonds, and Parmegianno. Glad you enjoyed the NY Pizza Crust Bobby! Tried this and loved it. Made it and split into three balls of dough. Froze two and used later. Absolutely wonderful. Very simple to make with stand mixer! I'm always looking for a good crust recipe. I'm trying yours tonight! Anyone have comments about flour brands and gluten content? John, I'm up in the Victorville, CA area and trust me....grocery products are a bit limited up here as opposed to down the hill. Sorry for the late reply Cindy. I think high gluten flour is easy to get online but possibly not in Victorville. You should be able to find bread flour though. Glad the whole wheat flour turned out tasty! Wow, this dough looks amazing, I must try it! I love this pizza dough. Pete has worked for years to come up with a great recipe and Tony's is the best. Thanks for posting John. A Birthday Bash with New York Style Triple Berry Cheesecake and Lots More!